In Plane Race play as an airplane pilot and prepare for a fast race against other aircraft pilots. 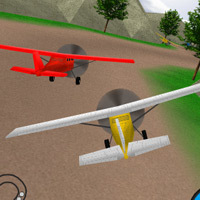 3D flying game where your task is to fly an airplane around tracks and compete with other airplanes. Win the races to earn money and unlock more tracks. Spend money in the aircraft garage to upgrade the airplane engine and improve handling.